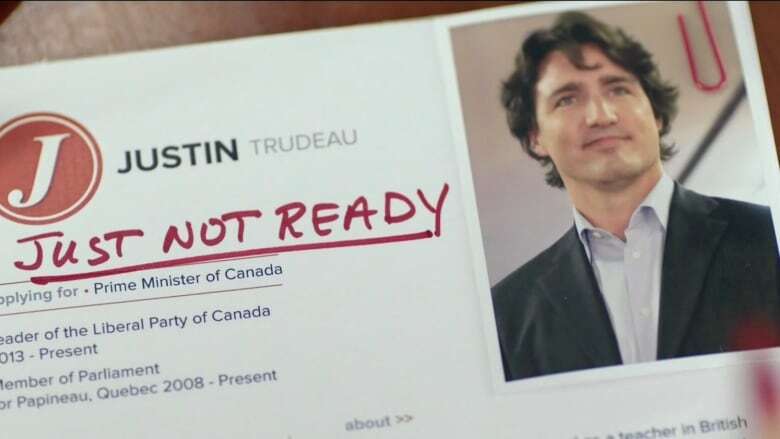 A Conservative Party campaign ad that asserts Justin Trudeau is "just not ready" has been running on television and the web for months now, and according to a Forum Research poll, the idea may be sticking. A Conservative Party campaign ad that asserts Justin Trudeau is "just not ready" to be prime minister has been running on television and the web for months now, and according to a Forum Research poll, the idea may be sticking. According to the poll, nearly half of the 1,384 people surveyed, 47 per cent, believe he's not ready for the job, while 39 per cent believe that he is. Forum attributes this result to Conservative advertising, arguing that despite his experience in Parliament, the ads have people doubting. "It appears that the relentless onslaught of one-message TV ads has had its desired effect. Despite serving eight years in Parliament, as his party's critic for citizenship and immigration, and post-secondary education, and being leader for more than two years, Justin Trudeau is branded as 'not being ready.'" said Lorne Bozinoff, president of Forum in a statement. The piece of advertising at the centre of this claim shows a group of interviewers attempting to assess if the Liberal leader has all the skills for a job based on his resumé. At the end of the ad the managers decide that he is "just not ready." NDP Leader Tom Mulcair had better luck in the poll, with 47 per cent believing he is ready to be prime minister, the same amount who saw Trudeau as unfit. Conservative Leader Stephen Harper fared the worst, as the vast majority of those surveyed, 69 per cent, believed he had been prime minister for too long. The poll was conducted from Aug. 30 to Sept. 1. The results are considered accurate within three percentage points 19 times out of 20. In July, Forum Research posted that the ad was having the opposite effect, however, as 32 per cent who had seen the ad said they were more likely to vote for the Liberals. Regardless of whether it has had a definitive impact on the way people perceive Trudeau, the phrase "just not ready" has embedded itself into the minds of Canadians. It's been used to taunt the Yankees and Blue Jays during Trudeau's visit. Trudeau thinks toddlers balance themselves. He's just not ready. "What is Justin Trudeau just not ready for? Maybe he is not ready for is dinner yet, which is perfectly fine, since it's only 2:00"
Or even a legitimate criticism. The Liberals CLAIM to support evidence-based policy, yet Trudeau says his favourite Avenger is The Hulk? JUST NOT READY. Trudeau's tried to argue he is ready. This ad was produced by the Liberal Party of Canada. It is embedded here for informational purposes and does not constitute an endorsement by CBC News. But now he's saying he's ready too. This ad was produced by the New Democratic Party. It is embedded here for informational purposes and does not constitute an endorsement by CBC News. Because there's an alternative from south of the border. Justin Trudeau... He's just not ready. But Deez Nuts are.